Take care of any necessary repairs before you find yourself stranded in the middle of a snowstorm. This may sound obvious, but I've known people who have driven around with emergency lights lit up on their dash who ignored them until the car stopped running completely. Make sure your tires are in good condition, properly inflated and appropriately rotated so you have traction when you need it. If you use winter chains, make sure they are ready as well. Also consider snow tires from Nokian or Michelin, they both rated well on Edmund's winter driving tests. Don't forget to check your spare tire, too. Keep your gas tank full! Grandpa Neverman (my husband's grandfather) was a stickler about always keeping the gas tank above half full. We've had some pretty serious snow storms in recent years where folks were trapped on the road in their cars for hours. It's a lot safer to be stranded in a car with heat than without. Also, traveling may take much longer than anticipated because of road conditions or detours. Check out weather conditions in the area where you intend to travel. Between the news, the internet and cell phones, there's little reason to not know if you're getting snow, ice, wind or anything else that will be trouble. Get a cellphone, even if it's only an emergency use smartphone and get a USB car charger or emergency radio/cell phone charger for your cellphone. If your battery is dead, it's pretty hard to call for help. What should be in a Winter Emergency Car Kit? 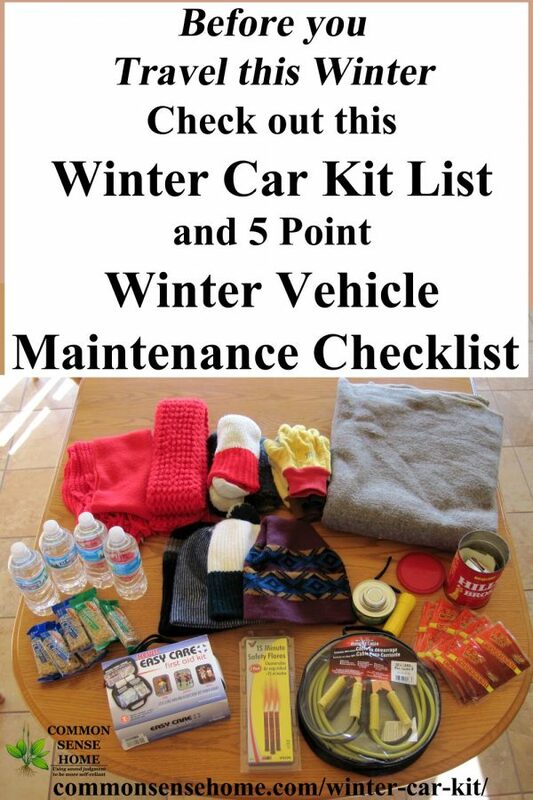 Your winter car survival kit should contain cold weather gear, basic survival supplies and tools for roadside repairs. First Aid Kit – Either a larger one for the car such as the Survival Solutions Traveler First Aid Kit. See the Best First Aid Kit for more information and things you should add to ANY first aid kit. Hats – If you are stuck in the snow you NEED a hat. Stash an extra hat or two in the trunk, preferably a lighter hat and heavier warmer hat. Layers – Long johns in your size and a full change of layered working clothes including underwear. If you get wet a set of dry clothes can make a huge difference. Outer jacket that stops the wind. A regular pair of work gloves and a pair of insulated work gloves in your size. Wool Socks – large sized (they should not be too tight) – wool socks will stay warm even if they get wet. If you really want to stay warm a good first layer is polypropylene socks. Boots – Have an extra pair in your car or truck. You could be dressed up or under-dressed going to the store for a quick trip, and end up needing to slug around in the snow. Consider getting them a bit larger so you can wear wool socks. 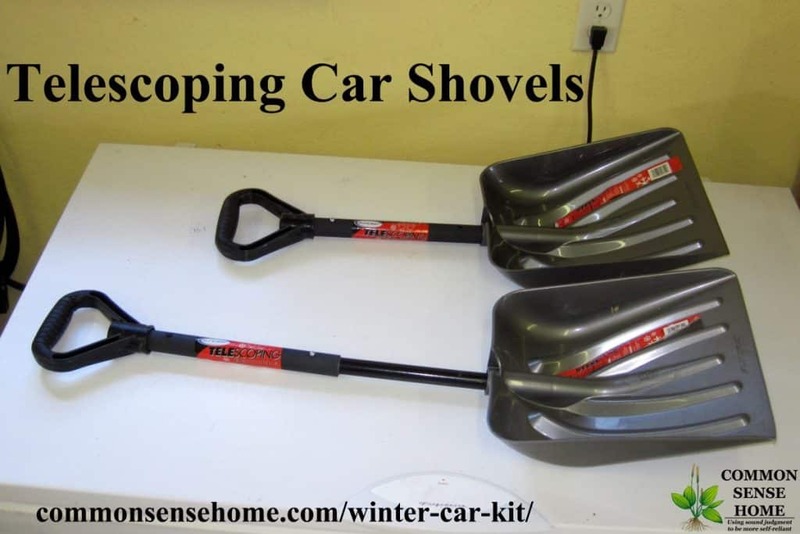 Car shovel – These are small collapsible shovels that make decent emergency shovels. Alternately, consider a fixed handle shovel. Sharp Knife. Consider a rescue knife (it can break a car window and cut a seatbelt) within reach of the driver. Flashlights. Having a couple in the car is a good idea. A few cheap AA Q5 flashlights, the AAA Lumintop EDC 01 and/or the 18650 Thrunite TN12, preferably including at least one waterproof flashlight. For more info see the “Best Cheap Flashlight” or “Brightest Flashlights“. Depending on which flashlight(s) you choose you will need extra batteries (keep at least 2 extra sets – they are small and if the car battery is dead extra lights will allow you to see in the dark. Jumper Cables – cold decreases battery life , and the heavier gauge gets more power to the car being jumped. The higher 800 amp cable is better than the 400 or 600 amp cables. Electronic Road Flares these avoid the risk of fire but require 6 AAA batteries (we recommend lithium or low self discharge rechargeable AAA batteries Eneloop or Tenergy) and you might also want Road warning flags because they don't require batteries. Bright colored safety vest or poncho, to make yourself more visible. Heavy Tow Strap if you have ever towed someone, a strap is a LOT safer than just rope or chain. At least two rolls of Duct Tape has an insane number of uses. It can seal a crack in a window, hold on a broken mirror, tape a trunk shut or in first aid situations: immobilize a limb, create temporary splints and even bandages. We keep a couple of rolls and have been happy to have them in the car or van numerous times. A couple of Sharpie pens. They can be used to write on pretty much anything, which is useful in an emergency. Keep an extra pair of prescription glasses, sunglasses and/or contacts in your car. Remember, the sunglasses are as important in the winter snow as in the summer glare. A towel wrapped around a few cloth diapers, wash cloth or wash cloths is a great add on. You can use the wipes to clean up and towel to dry off. Moist wipes are a good option also, a small package can help clean up a mess. We recommend the ARMYCAMOUSA Day Tactical Backpack which holds 40L and expands to 64L. We have this one and like it. Just big enough for two people or for bulky winter items for one. It has multiple compartments and a belt strap in case you need to hike home in an emergency. Kitty litter or sand for tire traction. Note – clay litter will make the road more slippery, not less. Use a different type, such as ground walnut hulls. Tire chains – especially if you don't have snow tires. You will need to research the right chain type for your vehicle. Thule and Security Chain both have decent reviews for their tire snow chains. If you don't have any chains or snow tires and are stuck, worst case you can try putting the floor mats under the tires for extra traction on ice. Snow tires. Nokian or Michelin are good snow tires. You will need to research the specific tires you will need. We agree with Edmunds – snow tires for winter, summer tires for the rest of the year. Emergency Phone Numbers – keep a paper list in your car. Your cellphone might be dead but the police or a good Samaritan may have a phone. See also below. Empty Gas Can – In case you run out, normally you would only need this if you travel more than 1 hour per day in the vehicle. An extra gas can lets you keep the engine running more to keep you warm. Just make sure the exhaust is kept clear. Our old car shovel was made of lightweight plastic, and broke the first time I tried to use it with heavy snow. Last winter I used one of these to help dig out someone in a parking lot who thought it was a good idea to park in a snowbank. (Christmas crazy shopping time and the lot was packed.) Heavy, hard packed snow, and the shovel was just fine and did the job. The boys like them for digging snow tunnels because of the short handles and their toughness. I keep our main kit in an old military backpack I purchased at FleetFarm – inexpensive and durable. Another kit went into a backpack. Some folks use totes, too. I keep the shovel and scraper separate from the rest of the pack, and food items separate from combustibles. If you pack nothing else, you should have hats and blankets enough for all regular passengers and a good ice scraper. The snow shovel and jumper cables are the next most important. You can just buy a pre-packed roadside emergency kit, but most of them are pretty skimpy, or just have car related items. The “Always Prepared 125-Piece Roadside Assistance Auto Emergency Kit with Jumper Cables” on Amazon looks to be better than most. But even this fairly good one needs extras (listed at the end). Contents: a Heavy-Duty 3-Ton Tow Rope, Window Breaker / Seatbelt Cutter, an Adjustable Wrench, Accident Report Form. Emergency Items: Battery Booster Cables, Reflective Safety Vest, Self-Powered Flashlight, 2 Light Sticks, Emergency Rain Poncho, Emergency Mylar Blanker, High Quality Reflective Warning Triangle, Whistle. First-Aid Items: First-Aid Tape, 25 Adhesive Bandage, 6 Antiseptic Towelettes, 2 Gauze Pads 5 Butterfly Skin Closure Bandages, 4 Knuckle Bandages, 4 Fingertip bandages, 1 Extra Large Bandages, 15 Small Bandages, 3 Iodine Pads, 10 Alcohol Prep Pads, 1 Bandage Roll, 10 Q-Tips, 1 Pair Disposable Gloves. We suggest you at least add: flashlights, duct tape, Quik Clot, Sharpie pens, blanket, fire extinguisher, ice scraper and a shovel. A friend of mine reminded me about another consideration – emergency phone numbers. Since you SHOULD lock your phone, consider leaving a ICE note or emergency contact list in your glove compartment, with names numbers and relations. Alternately leave it in your wallet or purse. In the ditch or in an accident? Call 911 give and give your location, share the condition of everyone in the vehicle and describe your problem. Follow the 911 operators instructions. Use the electronic road flare to mark the side of the road where your vehicle is located for rescue personnel. If you can avoid it, don't move on foot during a storm – you are likely to get hit in heavy snow. If you must leave your car or truck, carry a flashlight, wear reflective clothing if possible and avoid roads – also leave a note with your name(s), address phone, and where you plan to go and place it on the inside of the windshield. 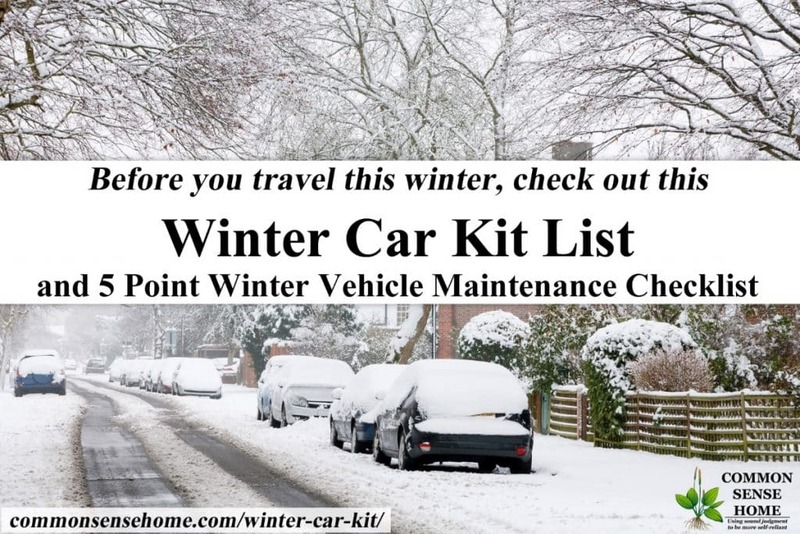 Use this post to be more prepared for winter roadtrips for Thanksgiving, Christmas and New Year celebrations or road trips later in the winter. You might not want or need every item in these lists, but they will get you thinking. 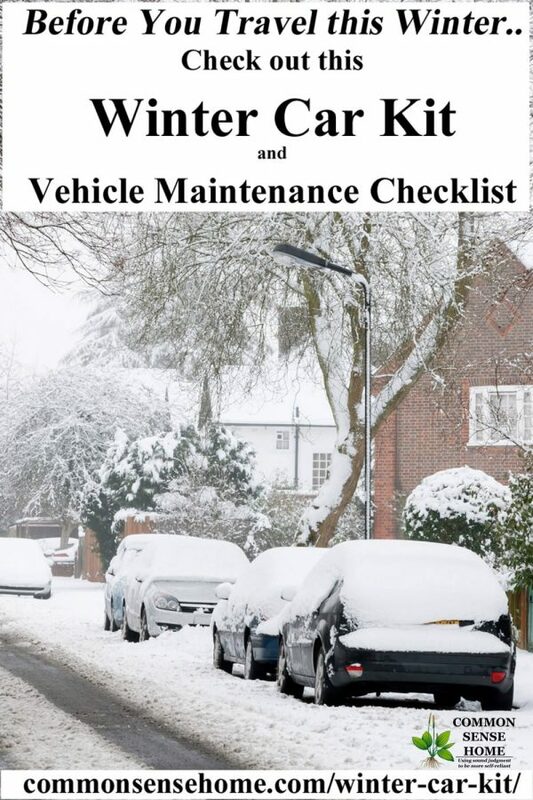 Use the lists to better prepared for a road side emergency, breakdown on a day trip, unexpected overnight hotel stay or other winter vehicle emergency. Having a few more supplies for the snow months could pay off if your vehicle ends up in the ditch or worse. It can even pay off if you are totally safe and just stuck in a hotel when you thought you could make it home. Having a toothbrush and toothpaste and a fresh change of clothes can make those winter storms less unpleasant. Is anything missing from this post? Let us know in the comments below and please pass this post along to friends if you find it useful. Originally posted in 2011, updated in Dec 2018. I pack our kits in those plastic totes. Also, add a roll of TP (for starting a fire if need be and for "normal use") You also might want to add a small bottle of hand sanitizer, it works for clean ups and as a fire starter as well. I was thinking about adding one of those power packs this year, just in case the battery in my truck goes dead, I can still charge up my phone as I wait for help. You also might want to carry an empty gas can. Gas stations nowadays don't have a can to loan out if you run out of gas and have to walk. If you drive a pick-up, carry a can in the bed during storms. If you have little ones, packing some powd formula and diapers and wipes for emergencies are a good idea. We also keep a spare set of clothes including socks and underwear for everyone in the car. Nothing nice, but good to have if you get soaked trying to get said car started or unstuck. Or if one of you kids is a random vomiter. Yep, those clothes have come in handy more than a few times. Yes! Rallllpppphhh rode with us a time or two in our car. From that day forward we were prepared! Oh dear… Thankfully we’ve never been blessed with that one. Don’t pack kiddies clothes that are the exact size. Pack small adult size stuff or even larger. Big can be shortened, pinned, belted etc where as clothes that are too small are useless. I used a vacuum packer to condense down clothes for the “kid pack” helps with saving space. Using the vacuum sealer is a great idea for keeping everything dry and compact. Thanks. Good post. We are taking our oldest son to college in Utah after the holidays so it is good to have a reminder on winterizing the car and supplies..It’s been a while since we drove in winter country.. I always add “kitty litter” to the list, helps if some one needs traction in a slippery situation. & Car Games or Books to pass the time till help arrives. I second that! I’ve seen plenty of little sports cars getting stuck going into their uphill driveways and sliding into embankments. Especially with the snowplow humps. It’s hard for them to get traction already but even harder when they’re on top of something and you can’t dig out under the car. Make it’so the old fashioned kitty litter, and not the newer clumping kind that will turn to mush in the snow. Yes, nothing clumping or clay based. Either will get things more slippery, not less. I’m glad you shared this in the NLN Lounge. Now that my car is ready for winter since the inspection is done, I need to get the inside of the car ready. I need to get in for new tires before the weather gets rough. Glad I’m not out in the mountains. Thanks for stopping by. You have forgotten to say that EVERYthing should be WOOL, not any kind of acrylic, Wool is thermodynamic so cools you down and warms you up so if you have to walk you wont sweat then chill … this is essential. You will have a hard time finding pure wool these days. They are almost always a wool ‘blend’ using some form of polyester…yuk!!! Also, I wish I could carry this in my vehicle, however I am a rural mail carrier, and have to use all the space for mail. I worry I might someday get caught and need this stuff, but won’t have it. I do manage to make room for a medium sized tool tote with a great first aid kit I put together myself. The clothing and blankets and most of the other tools, no room. A blanket might be something you could stuff under the seat, just in case. I did find real wool blankets at Fleet Farm. They were old European army surplus – complete with straw sticking to them. (Maybe former horse blankets?) Some of the new blends aren’t so bad, especially for under layers, but wool is still a reliable choice. What about the emergency blankets that are reflective? They are supposed to hold your heat in and are very small. If you don’t have room for a real blanket, perhaps those would work??? I also read that you could pack things inside a plastic barrel like what 5 gallon paint comes in so that it could double as a water carrier. Including a metal coffee can gives you the option of having something you could heat water with. Include some matches in a water proof container. If you were stuck somewhere remote, this might be good. Toilet paper. I know the city slickers might find this one strange, but out in the country, in an emergency, I like to have options! LOL Wipes might be better – could serve multi-purposes – depending on local average temperatures of course! This is true. You just never know how long you may be stuck. Are the water bottles in the img evian? No. I can’t remember the brand name at the moment, but it was a local store brand. My water bottles never burst. They are useless here of course because they stay frozen all winter. All vehicles should have an ABC type fire extinguisher in the passenger compartment, where the driver can get to it easily. If (heaven forbid) there is a fire, you need to be able to fight through the flames, to get to safety. The single most important piece of vehicle emergency equipment anyone can carry is a cel phone. It’s also a good idea to have clothes and blankets in bright colors. If you have to leave the vehicle, you want to be highly visible. Construction or hunting attire is not fashionable, but it can be a lifesaver on a dark road at night. Thank you all for these smart tips!. I’d been in a ditch in a 1982 Ford Mustang II due to wintery black ice in Nebraska years ago. I had… jumper cables and a sun shield.. It was COLD and getting colder.I was looking at spending the night in my car. Fortunately, a fellow church member spotted my car and drove me to a nearby church of ours. Never want to be in that tight spot AGAIN. EVER. Black ice is nasty! My sister and I ran into miles and miles of it on our way back from Chicago to northwest WI one winter. Traffic had slowed to a crawl, and then pretty much stopped. We ended up taking shelter with a benevolent trucker at a truck stop. He let us use his sleeper while he slept behind the wheel. Awful nice gentleman to run into on a cold and dangerous night. This is such a helpful post. Definitely bookmarking it to take a look at again as winter approaches. Thanks so much! Thanks, Jodi. I’m really hoping we don’t have another winter like the last one. I found those shovels, or ones just like them at least at Staples last year on clearance…$3 each, so bought one for each vehicle. Glad to hear they work well as we never used them…winter was ending. This is a great reminder post. Thank you! Plastic grocery sacks or small drawstring bags to cover exterior mirrors. Anytime I think it might ice over I bag my mirrors so I don’t need to risk damaging them. Industrial Trash Bags (3 or 4) (bought at Lowe’s or Home Depot) can be used to keep you dry and warm if used over clothes or can be used to make a temporary shelter if need be. I saw on a TV talk show that a bag of kitty little is good to have in truck in winter months. It will help get out of slick road condition if you get stuck and need some traction. Don’t forget medications, pain pills, asthma inhalers, etc. A small backpacker stove and some ground coffee or tea can do wonders to lift the spirits. If you’re carrying around a gas can with just a little gas, the motion of the vehicle will cause it to aerosolize, effectively creating a bomb, since the fumes burn much more readily than liquid gas. I really wouldn’t recommend this. No, you’re not likely to be hiking with 3-5 feet of snow on the ground, but if you have any sense or warning, you’re not likely to be out driving in it, either. The gas can would honestly be pretty low on my list – BUT – say you are stuck for a while and drain your tank, then can get out, but you have no gas to do so. Catch a lift to the service station, get your gas, get a ride back, put it in your tank and get out instead of calling a tow truck. O I forgot to add, for those who have allergies to wool, there are fabrics which wick moisture away from the body. Sometimes manmade can be a good thing. I’ve used these for other uses so I know they work. Thanks for a very comprehensive list and great ideas from all. Did I miss a flashlight? I also have a NOAA emergency radio (crank up style). And a tarp might be useful if you have to change a tire in the snow (or for shelter). I would add for 2nd or 3rd tier of emergency readiness for car … I have a tool that has a covered razor for cutting off a seat belt if it gets stuck in an accident situation and another tool on it is that piece you can use if you spin into water and the windows short circuit to break them and escape plus it has a flashlight with it. Granted you may never need it but doesn’t hurt to have it on hand. I never thought to carry a fire extinguisher in the car I may add that. And I also like the idea of using a tote container to keep all the e-items in the trunk. I would keep the wool or fleece blankets in the car ( if rolled up good pillows). And I have 2 seat back organizers for hand warmers, small first aid items, tissues, wipes, cheap rain ponchos, extra gloves, maps etc. and sm. food snacks. Extra sm. umbrella in glove compartment (can help with snow). Thanks again. Time to make sure everything is there for 4 riders. 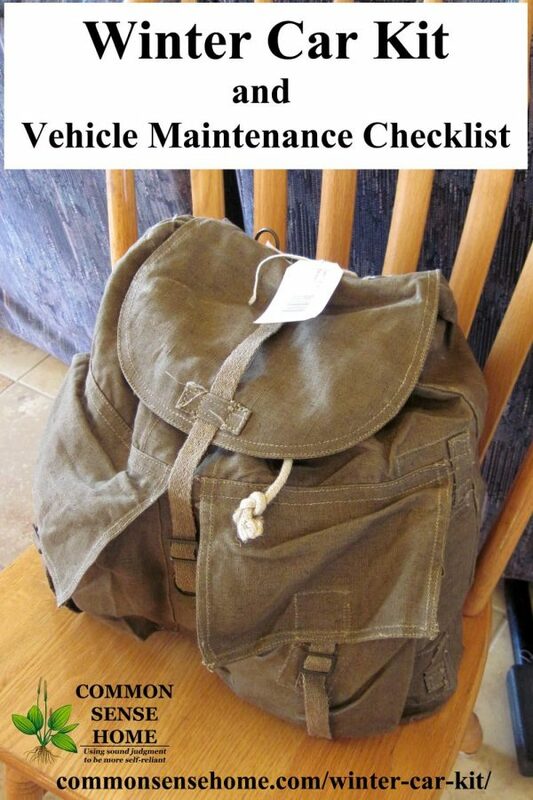 This is a very good list of item to store in your car. I would like to add that just in case things get wet, put your TP in a ziplock bag to keep it dry. I’ve had things break and get stuff soaked in the bin I car in my car, but the TP has always remained dry. Thanks, Larry. I’ll add a note about that. Good post. A few more things that weren’t said in the article. – Keep as much of the food and meds in a wide-mouth thermos. It’s not just high temperatures that affect shelf life and potency, temperature variations as well. When it’ll be freezing outside and inside the trunk, the thermos should keep the temperature inside more or less constant. – A shovel that’s not telescopic is less likely to break. Mine is from Fiskars, a reputable Swedish company, and it’s pretty solid. It wasn’t expensive either. – Get one of those flashlights that are hand-crank. That way, you won’t have any surprises. Keep in mind batteries discharge quicker in cold temperatures. You are right! Tell your friends, family and neighbors. Everyone should take your example and make it fit their area. Laurie and I lived near Duluth Minnesota and the freezing weather was VERY HARD on cars (and people). When we switch from summer to winter we swap walking shoes for snow boots and leave the work gloves but ADD gloves, mittens and hats (stuffing the gloves/mittens inside the hat). We also throw in wool socks which can double as gloves. We suggest you keep a wool blanket in the car also, it wont burn easily so it can be used to put out a fire or just wrap up in the back seat to keep warm on a long trip. Wool will also keep you warm even if its wet. A kneeler pad can be a godsend when its -20F and your are kneeling to change a tire or clear the car. The quick way to make sure the gas doesn’t get water/moisture is to add HEET to the car gas tank every other time you add fuel. Chocolate bars and other hard candy are good for a quick pick me up and last nearly forever. All the best!